Clear skies. Low 48F. Winds WSW at 10 to 15 mph..
Clear skies. Low 48F. Winds WSW at 10 to 15 mph. 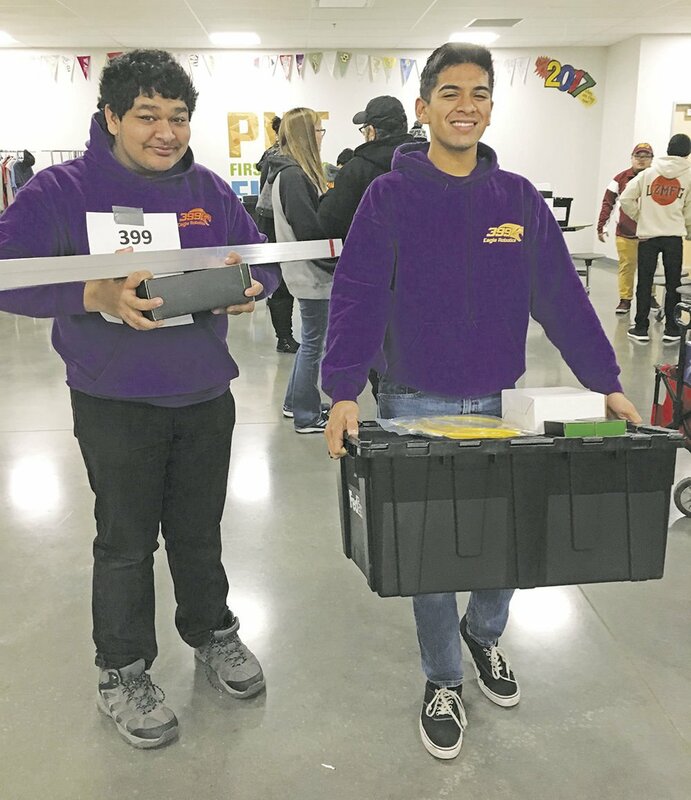 GATHERING PARTS — Zack Jafery, left, and Enrique Arjona of Lancaster High School’s Eagle Robotics Team 399 collect the kit of parts to build their robot during a kickoff event for the 2019 season Saturday morning at The Palmdale Aerospace Academy. Teams now have six weeks to design, build and test their robots to accomplish the tasks of the “Destination: Deep Space” game. WHAT DO WE HAVE? — Members of The Palmdale Aerospace Academy’s robotics team Gryffingear look through the parts received in the kit for the 2019 season in their workshop following a kickoff event Saturday morning. The team now has six weeks to design, build and test their robot to accomplish the varied tasks of the “Destination: Deep Space” game revealed during the kickoff. PALMDALE — An­tel­ope Valley high school ro­bot­ics teams, together with others around the globe, are preparing for a “deep space” mission, this year’s game challenge un­veiled Saturday morning. The teams will spend the next six weeks de­sign­ing, building and testing their robotic creations in preparation for the 2019 competition season. The Palmdale Aero­space Academy’s Gryf­fin­gear team played host to teams from Lancaster, Quartz Hill, Antelope Val­ley, Rosamond, Highland, Littlerock and Tehachapi high schools at its campus early Saturday, where they joined virtually with teams across the globe for the game reveal. As part of For In­spir­a­tion and Recognition of Science and Technology, or FIRST, an international or­ganization that pro­motes science education, the teams each year cre­ate robots designed to ac­com­plish a specific task. Teams and their robots face off in re­gion­al events, with the com­pe­ti­tions culminating at the international finals in April. This year’s game is called Destination: Deep Space, in which teams are on planet Primus and must load cargo into a cargo ship and rocket and prepare for launch in be­tween blinding sand­storms. To earn points, teams must place rubber ball “cargo” into one of two vertical rockets and a low-lying cargo ship at the center of the playing field. They must also place disc “hatch covers” over the openings of the rock­et and cargo ship to secure the payloads in­side. At the end of the match, the robots must return to the “habitat” to prepare for launch, a series of low steps at one side of the playing field, each step worth a different amount of points. “There’s a lot of twists” to the concept, said Aman­da Gonzaga of the Gryf­fin­gear team. The biggest twist for this year’s game comes in the initial 15 seconds of each match, in which a screen will drop to block the view of the playing field from the robot dri­vers, a “sandstorm” on planet Primus. While matches in pre­vi­ous years began with a 15-second period in which the robot was to op­er­ate autonomously with preprogrammed com­mands, this year’s ver­sion allows teams to choose to either go with the autonomous approach or to use cameras and vis­ion software to manually drive the robot from be­hind the blackout screen. “If something goes wrong, you’re not going to know,” Gonzaga said, a sen­tim­ent echoed by other teams. “I’m just thinking about all the things that could go wrong” and how to avoid them. The decision of whether to use autonomous pro­gram­ming or to manually drive with cameras will have a snowball effect on other design decisions and even things such as what awards the team may be eligible for, Gryffingear’s Giselle Baez said. Once they viewed the video introducing this year’s game, teams col­lect­ed kits of parts provided by FIRST and jumped right into brainstorming ideas for how to approach the challenge and what their robots will need to do. “It challenges us in new ways, but uses some con­cepts from previous games,” said Enrique Ar­jo­na of Lancaster High School’s Eagle Robotics, Team 399. Tasks such as launching rub­ber balls through tar­gets and hanging the disc “hatch covers” have been part of their robots before and this prior experience will be helpful not only for their own creation, but also as they mentor other less experienced teams, he said. Antelope Valley High School’s Robolopes team mem­bers were beginning to see strategy, such as ma­king sure their robot stays short enough to rest on the highest step at the end, worth the most points but with a total height limit. “This year is going to be our year,” Gryffingear’s Kris Barrios said in the team’s workshop. In previous years, the team has struggled with the autonomous portion of the match, so being able to use vision tracking and manually drive the robot should be a plus. “I’m pretty sure we can do vision magic,” he said. Nearly all the local teams will be participating in the Aerospace Valley Re­gion­al competition at East­side High School in Lan­cas­ter on April 3 to 6. The homegrown com­pe­tition will feature 38 teams pri­marily from across the state, but also Flo­rida, Nev­ada, Turkey, Swit­zer­land and Columbia. The matches are free and open to the public.